The 1980 cloud seeding campaign of the Texas High Plains Experiment (HIPLEX) was conducted in West Texas during the spring/summer of 1980. Texas HIPLEX was managed by the Texas Department of Water Resources under a cooperative agreement with the U.S. Bureau of Reclamation (BuREC). Other national, state, and local agencies involved in the 1980 field project included the Colorado River Municipal Water District (CRMWD), Texas A&M University (TAMU), Texas Tech University (TTU), NASA, NOAA, and NCAR. The 1980 deployment was similar to previous years (1976, 1977, 1978, and 1979) and the operational areas and networks are shown in the Network Map. The early years of the Texas HIPLEX Program consisted mainly of exploratory research, i.e. data collection and some initial analysis. 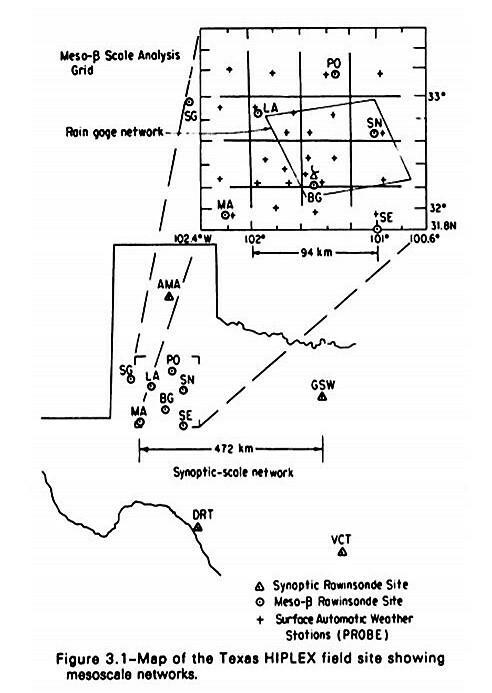 During the 1979 and 1980 field campaigns, increased analysis efforts were directed to understanding the mesoscale controls of convective cloud development and the microscale properties of cloud and precipitation processes. 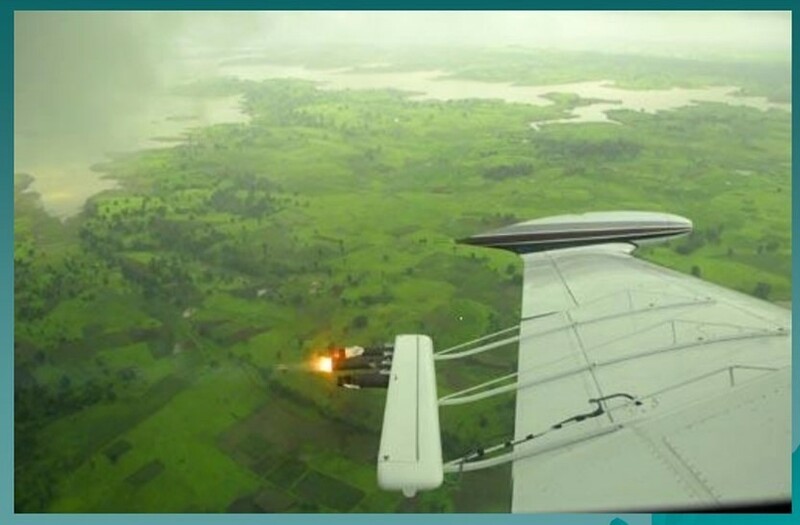 Emphasis was placed on cloud seeding and measurements of growing cumulus clouds in the -4 deg C to -10 deg C range. The primary goals of the Texas HIPLEX research effort were to understand natural processes leading to rainfall in West Texas in order to develop a sound cloud seeding hypothesis and conduct agroeconomic studies to estimate the potential benefit-to-cost ratio for weather modification. Specific objectives included: (1) collection and analysis of rainfall, radar echo, cloud physics, mesoscale surface/rawinsonde, and satellite data (including real-time) to provide a base of information required (including real-time) to design a precipitation management program and improve forecasting techniques; (2) development of physical hypothesis relating cloud seeding to enhanced rainfall and perform accurate and deterministic studies of the interactions between convective clouds and their environment; and (3) development of social-economic baselines of information of an area-wide experiment. A network of 16 manual surface stations collected 10-min averages of standard meteorological measurements, which was deployed, maintained, and data processed by TAMU. BuREC operated a automated mesonet of 25 PROBE stations. In addition, rainfall data was collected at 81 fence-post gauges and 106 recording gauges that were deployed, maintained, and data processed by CRMWD. Atmospheric soundings were taken from 7 stations on mesoscale operational days from 15 May to 30 June, except for the Big Spring station which remained operational through 15 July. Soundings were made at 3-h intervals from 1500-0300 GMT. All soundings were initially processed in near real-time for preliminary data to be used for real-time evaluation of atmospheric conditions for forecasting and aircraft scheduling. These stations were deployed, maintained, operated and data processed by TAMU. In addition, routine and supplemental soundings were taken by the NWS at Midland, TX. Radars deployed consisted of the SWR-75 (Skywater Radar), a 5-cm radar operated by (BUREC and TTU) located in Howard County, TX, and the FPS-77 radar located at the Big Springs Municipal Airport. In addition, data was obtained from the NWS radar at Midland, TX. 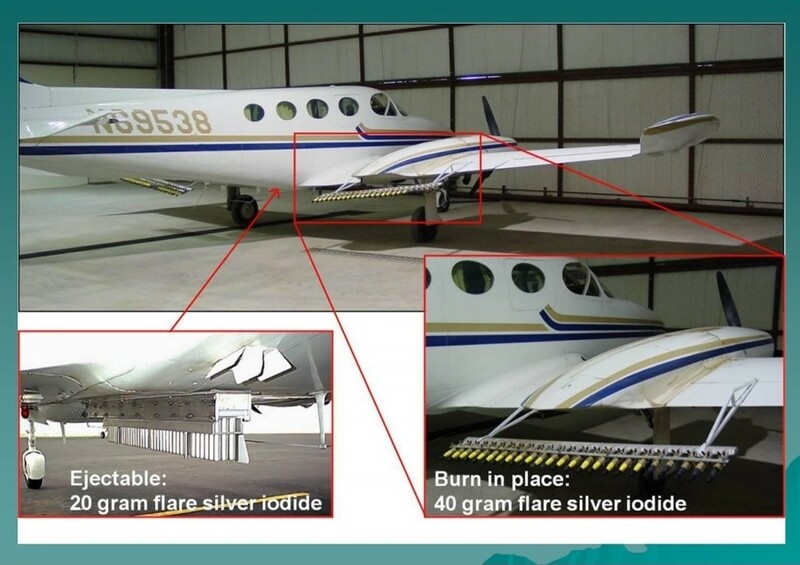 Two aircraft participated including the CRMWD turbocharged Piper Navajo (P-Navajo) for on-top cloud seeding and cloud physics measurements, and the NCAR Beechcraft Queen Air (Tail #N306D) for cloud physics measurements. Twenty-two (22) missions were flown by the NCAR Queen Air from 16 May through 15 June. Satellite GOES visible and infrared imagery at 30-min intervals including quantitative radiance data. Five (5) Research Rapid Scan Days (RRSD) for field campaign. For more information regarding Texas HIPLEX, please see HIPLEX.pdf.